WASHINGTON — The era of trillion-dollar budget deficits is about to make a comeback — and a brewing budget deal could mean their return comes just next year. Talks on a budget-busting spending pact that would give whopping increases to both the Pentagon and domestic programs have been inching closer to an agreement, aides and lawmakers said. GOP defense hawks are prevailing over the party’s depleted ranks of deficit hawks while Democrats leverage their influence to increase spending for domestic priorities such as combating opioid misuse. Details are closely held and subject to change. But at issue is a two-year deal to increase crunching caps on spending set by a failed 2011 budget deal. Republicans have pushed for defense increases in the neighborhood of $80 billion a year and have offered Democrats nearly as much — $60 billion or so per year — for nondefense programs. The final tally for the budget deal could total close to $400 billion. 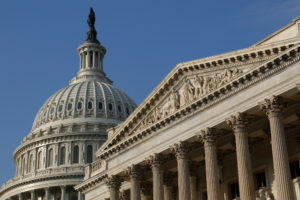 The negotiations are bipartisan since it takes votes from Democrats to lift the budget caps and advance a follow-up omnibus spending bill, whose overall cost is likely to exceed $1.2 trillion. That means domestic programs get their due, despite the opposition of conservatives. Still, Republican deficit hawks stepped aside during last year’s tax debate, and it’s not looking like they’ll mount a stand now. Instead, GOP defense hawks worried about lagging readiness, training and weapons procurement are carrying the day, even if it means placating Democrats with spending elsewhere. “This budget dysfunction has a human cost, and our military is bearing the brunt of it,” said Mac Thornberry, chairman of the House Armed Services Committee, citing a spate of casualties from training accidents last year. The budget talks are closely held and occurring as lawmakers struggle to sort through a solution to protect younger immigrants soon to be at risk of deportation with Trump’s elimination of the Deferred Action for Childhood Arrivals program, called DACA, established by President Barack Obama. House Minority Leader Nancy Pelosi, D-Calif., has linked progress on the budget with action to address DACA, but other Democrats are beginning to agitate for delinking the two, lest the opportunity for a budget pact be lost. A trade of offers on Thursday represented progress, aides said, but an agreement didn’t appear imminent. The aides, both Democrats and Republicans, spoke on condition of anonymity because the talks are secretive. The budget caps are the hangover from the 2011 Budget Control Act, negotiated between Republicans and Obama, that prevented a default on the national debt and established a deficit-cutting supercommittee. But the failure of the supercommittee left behind unrealistic automatic spending cuts, known as sequestration, and today’s stringent spending caps. Deals in 2013 and 2015 eased the effects of sequestration by replacing cuts to domestic agency operating budgets and the Pentagon with spending cuts and fee increases elsewhere in the budget. Those offsetting measures tended to be relatively pain-free, though. This year’s looming deal is too big, however, to be fully offset with easy cuts elsewhere so Capitol Hill leaders would simply be adding much of its costs straight to the $20.6 trillion national debt. In the wake of last year’s tax bill, the Congressional Budget Office says the deficit for 2018 will hit about $700 billion — before any fresh increase. Next year’s deficit is already estimated to reach $975 billion, so the brewing agreement would mean the first $1 trillion-plus deficit since Obama’s first term. House Budget Committee Chairman Steve Womack, R-Ark., told reporters at a GOP retreat that he is considering abandoning the chamber’s traditional pursuit of a budget resolution this year. Under Capitol Hill’s arcane rules, the annual budget resolution is a nonbinding measure that lays out priorities on spending, taxes and deficits. But it takes follow-up legislation to implement these priorities.